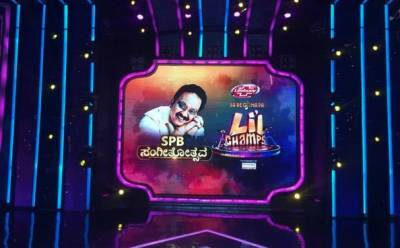 Zee Kannada’s Sa Re Ga Ma Pa Li’l Champs Season 14 showcases our young superstars outperform themselves every day, as they move on to face further challenges in the most entertaining music reality show there is! Tuning up the entertainment element by several notches higher, S. P. Balasubrahmanyam takes stage with Dr. Hamsalekha this weekend. For the first time ever, our little superstars from Season 14 will get a once-in-a-lifetime opportunity to perform in front of two music legends. Watch this ultra-special episode only on Zee Kannada’s Sa Re Ga Ma Pa Li’l Champs Season 14, on 24th and 25th February, between 7:00 and 9:00 PM. As an ode to the musical journey that these two legends share, S. P. Balasubrahmanyam and Dr. Hamsalekha make a comeback to the small screen in this special episode and this is bound to enthral Kannada audiences around the world. S. P. Balasubrahmanyam’s association with Dr. Hamsalekha began with Premaloka in Kannada. With over 40,000 songs in various Indian languages, he has sung the most number of songs for Dr. Hamsalekha in Kannada. The Sa Re Ga Ma Pa Li’l Champs Season 14 special episode would be one to reminisce, celebrating the everlasting hits of this legend-duo. Dr. Hamsalekha and S. P. Balasubrahmanyam lauded each other with utmost modesty welcoming one another to the Sa Re Ga Ma Pa platform. The music legend inaugurated this special episode with Karnataka’s all-time-favourite song, Ee Bhoomi Bannada Buguri from Mahakshathriya, as he watched the crowd go exuberant. Singer Vijay Prakash paid a tribute to SPB with a very special performance, making this a memorable evening for the Sa Re Ga Ma Pa Kutumba. With S. P. Balasubrahmanyam’s countless achievements in the music industry, he remains to be every Li’l Champs’ role model today. A surreal moment for all, SPB welcomed contestant Neha, along with every other contestant on stage with a rose, symbolizing love and respect for their dedication to music. S. P. Balasubrahmanyam goes one step further to reward the contestants; he signs the medal that would be awarded to the final winner of Sa Re Ga Ma Pa Li’l Champs Season 14.